Info "Move your hands up and down and dance, dance, dance, you crazy monkey! The infectious rhythm calls monkeys far and wide!" 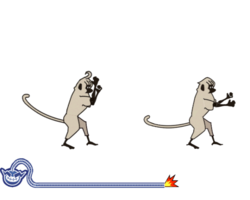 Monkey Dance is one of Orbulon's Microgames in WarioWare: Smooth Moves. The player must swing his arms up and down and dance with the monkeys. 1st level difficulty: Short dance. 2nd level difficulty: Long dance. 3rd level difficulty: Very long dance. This page was last edited on February 20, 2018, at 18:14.